Hashnest, the Bitcoin cloud mining platform by BitMain, has been having trouble with the hashrate provided by their partner UMISOO for the last few days and the problem apparently still persists. 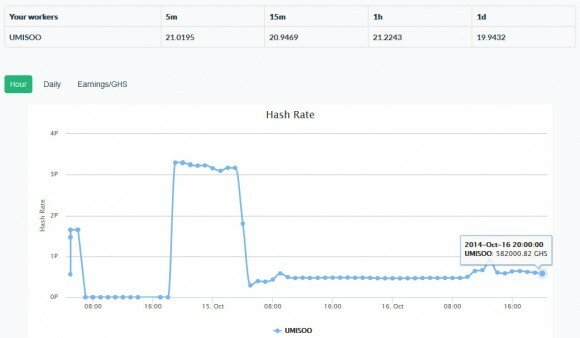 Starting around 12th the hashrate provider UMISOO apparently suffered a power failure resulting in some reduction in the available to the users hashrate. The hashrate drop however has continued and the problem is still present with the actual total hashrate provided by UMISOO reported by Hashnest at just 0.5 THS instead of the normally available 4 THS. This all means that all of the users that have purchased Bitcoin cloud mining hashrate are currently getting much lower actual hashrate than they have paid for. Our test account at Hashnest with 120 GHS shows an average of just about 20 GHS for the last 24 hours and in the last few days the average hashrate we got was not much higher than that number. Getting reported at just about 1/6 of what you have paid for and the problem continuing for days without being resolved is a reason enough for us to recommend to stay away from Hashnest for the moment and if you were considering to invest in hashrate in the platform to think again. There is some talk about the problem being with just the reporting of hashrate as well as compensations from the hashrate provider that will be distributed to the miners, but it is hard to keep a track of what is actually going on as the service operators are not doing great job at keeping the users updated with the current situation.